For a super- simple fish pie recipe that the kids will love look no further. Cook whatever fish or vegetables you have available – even day old cooked veg will do the trick, just cut them up small and chuck them in! 1) Flake the fish in a bowl and add your veg. Mix in the crème fraiche. 3) Dollop the mixture into a baking dish and smooth it flat. 5) Smooth the mash with a fork and score criss-cross lines in it with the back of the fork. 6) Sprinkle a handful of cheese on top. 7) Bake for 15 mins or until the top is golden brown. These fold over pizzas look like giant pasties. 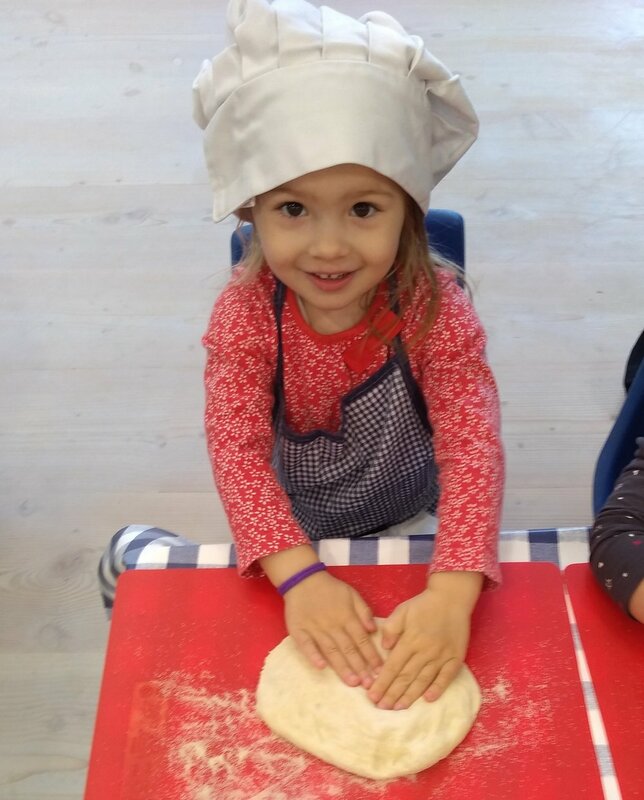 Your little ones will love squeezing, pushing and pulling the dough. Great to make, great to eat. Win win! -Heat oven to 220C/200C fan/gas 7. 1. Roll your ball of dough to a circle, roughly 20cm wide. Spread a little passata over each base, leaving a border of about 1cm around the edge. Season well. 2. Top with the peppers, sweetcorn, mozzarella, Parmesan, basil and blobs of pesto. 3. Fold each base in half, to make a half-moon shape, then squeeze the edges together, rolling them a little to stick and create a seal. Cover the tray with cling film and leave for 10 mins. 4. Brush the calzones all over with beaten egg, then bake for 25-30 mins or until puffed and golden brown. More falafel than burger, these are a delicious served in toasted pitta bread with salsa and salad. There are lots of herbs and spices in this recipe, and the usual Little Chefs rule applies - if you don’t like it, don’t put it in! 1) Mash the chickpeas up in your bowl and mix with the onion, garlic, parsley, spices, flour and a little salt. 2) When your mixture is fairly smooth, shape into a pattie with your hands. 3) Heat the oil in a non-stick frying pan, add the burgers, then quickly fry for 3 mins on each side until lightly golden. Serve with toasted pittas, tomato salsa and a green salad. 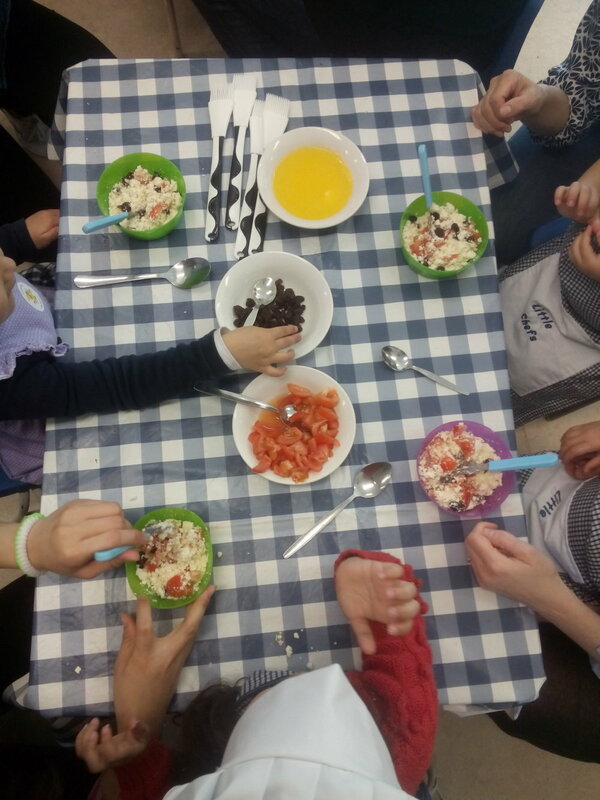 Our Little Chefs loved these, and what’s not to love - rice in a crispy ball with gooey cheese in the middle, yum! A great way to use up left over risotto or make it from scratch, starting a couple of hours before you want to eat as you want the rice to get cool and sticky. Cook the risotto: Make up 3 cups of hot stock using Swiss bouillon powder. Heat 1 teaspoon olive oil in the pan, add half an onion, finely chopped and 1 clove finely chopped garlic and cook 2-3 mins, then add the rice and stir well. Add the hot vegetable stock one cup at a time, adding as it is absorbed (this will take about 25 mins). When it is cooked it will be tender but firm. Leave the risotto to cool for at least 30 mins so it gets sticky for rolling. 1) Stir the beaten egg from the cup into the risotto. 2) Now get a tablespoon of risotto and flatten it into the palm of your hand. Place one cube of mozzarella in the centre of the risotto and close the rice around the cube, shaping it into a ball. 3) Roll the risotto ball in the flour, egg then breadcrumbs. Set it on a piece of baking paper until you're ready to fry all your risotto balls. 4) Once you have made all of your balls, heat the rice bran oil in a deep frypan on the stove. When the oil is hot and ready (a wooden spoon should 'bubble' when placed in the oil) fry your arancini balls in single layer batches until they are golden brown. 5) Drain the arancini balls on paper towels. 6) Serve warm with tomato sauce, basil leaves and salad. These are great for a light lunch and would work well in a picnic too. We’re not sure why they are called Pizza quiches as there’s no cheese in the recipe but you could easily add a bit of grated cheddar or feta to make them more pizza-ish. Delish. 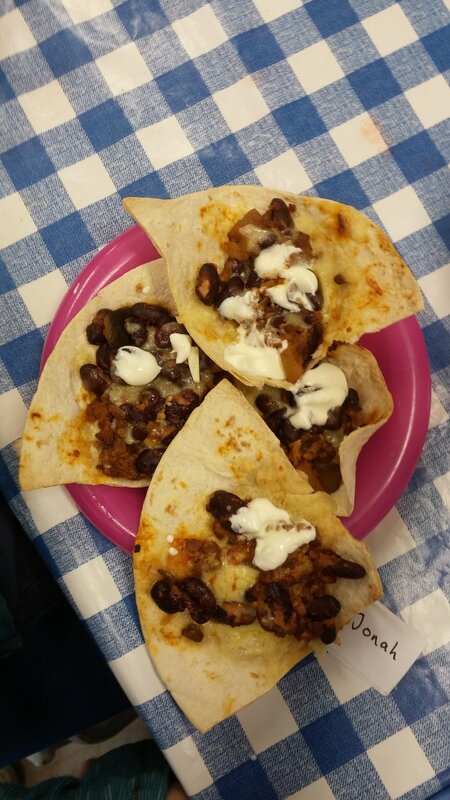 1) Using a small bowl (about 12cm diameter) as a cutter, cut 3 circles from each tortilla wrap. 3) Crack the eggs into a bowl and whisk with a fork. 6) Bake for 15 minutes until the egg is set. We have yet to meet a child that doesn’t like pasta! This yummy bake is gluten free and meat free but easily edited to your taste. The idea is to layer it up with sauce and cheese - your little one will love helping spread, dollop and sprinkle this dish together with you. Chop and brown 1 onion in a deep frying pan, then brown the mince and add a jar of pasta sauce, simmer for 15 mins. 1) Put half the pasta in a large ovenproof gratin style dish and spread it out evenly. Lay the cheddar cheese slices on top of your pasta. 6) Bake in the oven until all the cheeses are melted. A cross between pasta and potatoes, these Italian dumplings are fun and messy to make. Delicious with pesto or your favourite pasta sauce. It was a one-hit wonder at Little Chefs who are still scraping the dough off the chairs! Put the egg into the potato mixture. Add the flour, grated cheese, then mix together until you have a smooth dough. If it’s too sticky, add more flour. It should feel a bit like play dough. Divide the dough into 4 balls and on a lightly floured surface roll the dough into long sausages. Next cut with a knife this into 2cm pieces. Press each gnocchi with a fork to make a ridged pattern (this helps them to cook and also helps the sauce stick to them). Bring a large pan of water to the boil with a pinch of salt. Cook about 10 gnocchi at a time, gently lowering them into the water with a sieve or slotted spoon for about 30 second. When it is ready the gnocchi will rise to the surface of the water.. Remove the gnocchi and put into a warmed bowl. To serve, stir in fresh pesto or other pasta sauce. Serve with cucumber and cherry tomatoes. Haddock Puffs (otherwise known as fish parcels) has got to be one of our all-time Little Chefs favourites, so we usually do it at least once a term. It’s so easy and yummy, you can do it at home with any kind of cooked fish, or just broccoli or spinach if you’re not a fish fan. One of our regulars, Kerry, even made it at home with shredded chicken and mayo and said it was soooo good! Preheat oven to 220C/425F/Gas 8. Cut your haddock fillet with scissors into bite size pieces. Tear off the watercress leaves and add them to the mixture, stirring it all together. Lay the pastry rectangle in front of you, with the short edge nearest you. Spoon the mixture onto the bottom half of the pastry, leaving a 1cm gap around the edge. Brush the edges with a little milk then fold the top half of the pastry over the mixture, then press the edges down together. Put two slits in the top (to let the steam out) and brush it with a bit more milk. Place on a baking tray lined with baking paper, and bake for 25-30 mins until the pastry has turned golden brown. Serve with steamed broccoli and cherry tomatoes. Easy but high impact, this is a good store-cupboard recipe to throw together for a lunch or midweek supper. We used vegetarian mince with ratatouille but you could even make it with left-over chilli or bolognese. Thumbs up all round! Fold the tortilla wrap into four then cut along the folds with scissors so you have 4 quarters. Press each quarter of the wrap into each muffin hole. Mix the mince, kidney beans, ratatouille and paprika together in a bowl. Divide the mixture between the wraps in the muffin holes (don’t worry if the wraps overlap) Sprinkle over the cheese. 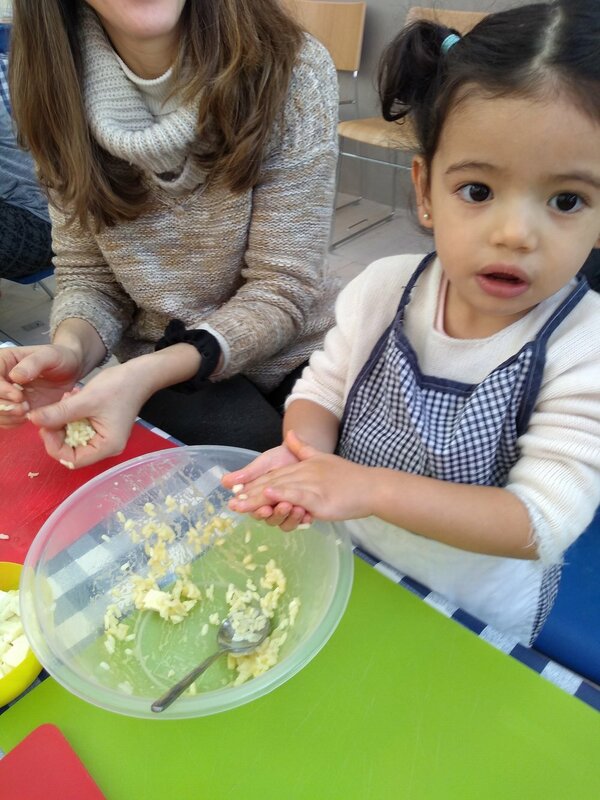 Spring rolls have become a firm favourite with our little chefs and the grown ups who come with them to the group. We always get comments on how simple this recipe is and it’s easy to adapt to your own tastes. We’ve tried a few different options for fillings and this has been the most popular combination so far. The usual Little Chefs rule applies – if you don’t like it, don’t put it in! Mix the carrot, beans, beansprouts, chicken and sweetcorn together in a bowl. Add 1 tbsp sweet chilli or plum sauce of your choice and stir well. Lay a piece of filo pastry on the work surface in a diamond shape with one corner pointing towards you. Brush with a little oil, then cover with a second piece of pastry. Brush with more oil. Spoon a good dollop of the filling onto the corner nearest you (remember the filling mix should be enough for 8 rolls). Fold this corner towards the centre and tuck it under the filling. Fold the two outside corners in towards the middle so it looks like an envelope. Brush with oil, then roll up the pastry into a parcel. Repeat with the remaining mixture and pastry. Bake in the oven for 15-20 minutes, or until crisp and golden-brown. 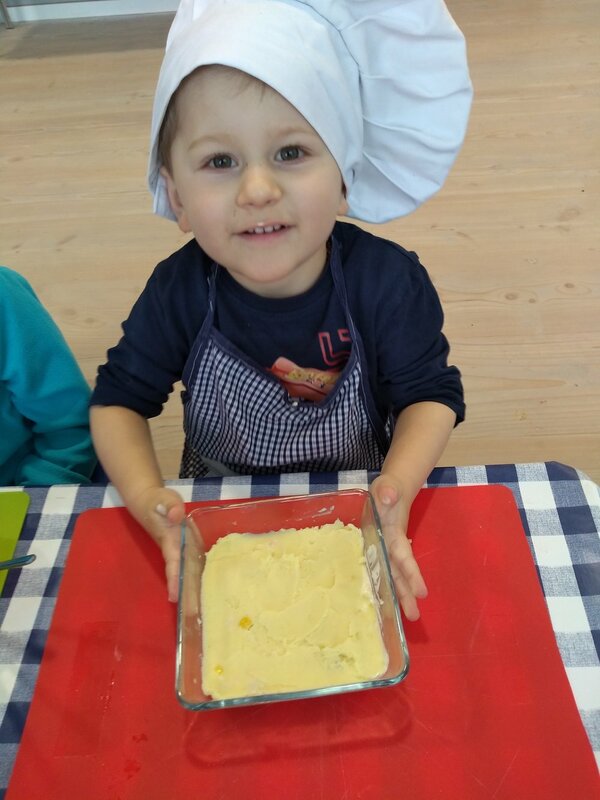 Welcome to the Little Chefs blog! 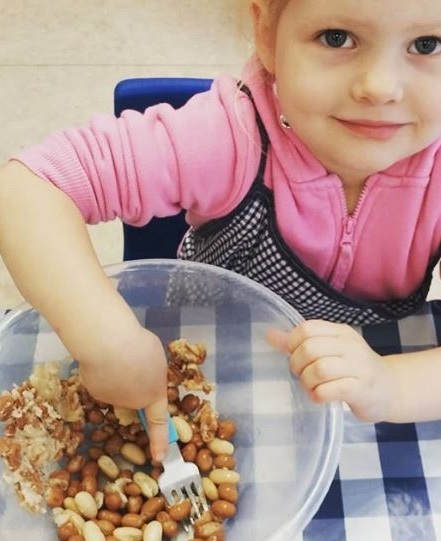 A glimpse into what happens at St Peter’s at midday on a Thursday (term time only) and the place to pick up some delicious, healthy, tried-and-tested-on-two-year-olds recipes to make at home. For our first post we’re sharing our end-of-term special from July - home made burgers and kebabs, in case we have another burst of BBQ weather before autumn kicks in! Here served with a Little Chefs favourite – cucumber batons. If you are using them, wash and tear lettuce and slice tomato and cucumber for burger fillings. 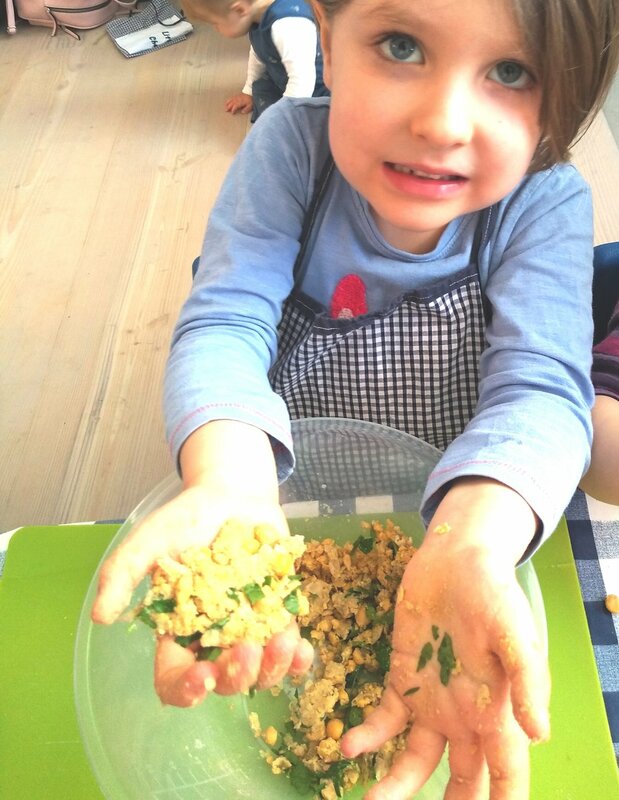 Combine the mince and egg in a bowl and squash together with your hands until well combined. Add breadcrumbs and continue to squish until it is not too sticky and forms a fairly firm burger patty. Wash your hands well after this stage. Cook the burgers on the barbeque, making sure you cook both sides (or use a frying pan with a little oil). Cut into one of the burgers to check it is cooked all the way through. Build your own perfect burger with buns, tomato, lettuce, cucumber, cheese and ketchup. Thread the vegetables onto the skewers – only use the vegetables you would like to eat later! BBQ the kebabs for a few minutes until the veg has softened. You can also drizzle with a little oil and grill the kebabs, checking them regularly so that they don’t burn. Serve alongside the burgers and cucumber batons.